Euro VI compliant, 2.2 tdci 125ps 6 speed manual, available in base or trend specification, white and silvers generally available from group stock, other colours may be available - call for details. Livery / sign writing are available along with delivery to your door step, meaning Minibus World are well placed to cover your current and future Minibus requirements. 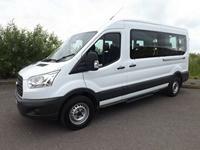 We are also the only Motor Manufacturer offering a Ford Transit 15 seat Minibus you CanDrive on a standard category B car licence (conditions apply) with no D1 needed. This is a perfect School Minibus Leasing vehicle for those of you who have D1 licenced drivers. Call 01782 444289 and ask for our sales team.